*The new supply number has arrived, so once the farm team have sorted the logistics of herd order at milking the kgMS/cow will be split between kale and FB farmlets. **x10 cow’s milk is kept for calves. No peno milk is fed to calves. *If required, inshed feeding will be used to full any deficit in the kale farmlets and baleage in the FB farmlets. It looks like the different N fertiliser regimes are starting to impact on pasture growth rates, although we will be more confident in this assertion after the farm walk next week. Pastures in the low impact systems have more pronounced urine patches and are less dense between the urine patches. Stems are elongating and leaf emergence is slower. The lower overall growth rates this week have averaged out last week’s higher than expected growth rates. We would like to apologize to C-Dax and farmers using the C-Dax Pasture Meter for the confusion we created last week with our comments regarding current issues with pasture mass estimation at SDH. At the outset of the farm we committed to being open and honest about our processes, challenges and performance, however we should have given more thought to how this was communicated in this instance. We are confident that the C-Dax Pasture Meter is accurately recording the height of our pastures and thank Darrin from C-Dax for his numerous visits to the farm to check that our unit is working correctly. One thing we did identify is that we didn’t have a consistent power supply coming through from the battery which we have rectified by changing the cable connections. We are still trying to determine, why the calibration equations we have available (standard Southland equation, modified Southland equation and Canterbury equation) are not giving us estimates of pasture mass that we are confident in using on their own for feed allocation. This was the basis for our comment around using a range of information for decision making last week. Converting height to mass is the fundamental principle with all pasture mass estimation tools and we know from previous experience that cultivar, growth stage, species mix, time of year and farm specific management will affect this. Factors specific to SDH which we suspect may be contributing to our challenges are: diverse range of pasture species, 80% of the farm in 1 or 2 year old pastures (some of which didn’t have ideal establishment and grazing management during the conversion phase), a range of pasture density (especially in some paddocks on our Low impact farmlets) and plant physiological changes i.e. heading that are currently happening on the farm. With the hectic start to the season, we have not had the resources or headspace to create a calibration that will work for us across the range of farm systems we are implementing. We are in the process of identifying additional resource from within the SDH partners and are committed to finding a solution. With 104 paddocks and 300 ha to measure each week using the C-Dax Pasture Meter has definite advantages over spending 6-7 hours with the plate meter!! 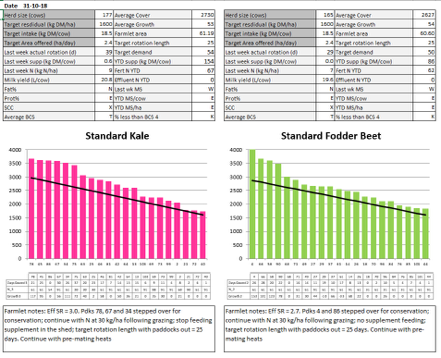 From the feed wedges, the standard kale and FB farmlets are showing a significant surplus. Paddocks that meet the specifications to be taken for baleage have been identified and include: x3 standard kale paddocks and x2 standard FB paddocks. 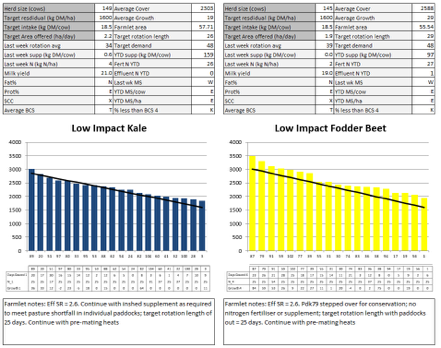 Due to the lower surplus in the low impact farmlets and inability to use resources such as N fertiliser to help get out of a feed deficit if growth slows, no paddocks will be taken for surplus from the low impact kale and only one from the low impact FB. This decision will be reassessed early next week depending on weather conditions and increased pasture cover buffer. Removing paddocks for conservation will help decrease the rotation length and associated opening covers. The 0.5 kg/cow/day of in-shed supplement will be removed from the standard kale farmlet. However, until we see a lift in residuals, strategic inshed feeding to the low impact kale farmlet will continue. Grazing residuals and pre-graze pasture cover for each paddock will be monitored to be monitored by the farm team each day to determine whether supplements are required. Last week a total of 59 calves were weaned and sent to the support block. On Wednesday the R2s received their last PG jab and KMARs were applied. They will be observed for heats and mated over the next 5 days then turned out with the bulls. Next week the R2s will be sent to the grazier. Ammo31 was applied at a rate 36 units/ha to x3 low impact paddocks that missed application in the first round. Pasture samples collected in mid-October varied in DM, crude protein and ME between paddocks. Crude protein and ME were slightly lower from the LI farm paddocks but the between paddock ranges were larger than the between system differences. Our latest lifted fodder beet sample had a DM% of 12, crude protein of 12% and soluble sugars of 52%. Relative to the samples submitted before lifting in late August the DM decreased from 16%, crude protein increased from 10% and soluble sugars decreased from 57%. One more staph cow was identified from monitoring this week. We are currently looking at options to re-integrate these cows into their farmlet herds without increase the risk of cross infection. SDH, SDDT and SDRF had a strategy session this week. The SDRF AGM and board meeting was also undertaken. 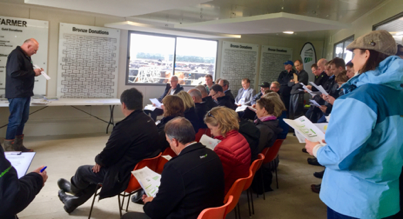 DairyNZ board members were down for the DairyNZ AGM and set aside an afternoon to come out for a joint tour of the hub with SDRF. Thanks to Ross Monaghan and Dawn Dalley for speaking around the environmental plan for the hub and the farmlet and young stock preliminary results. R2s have received a pour-on in preparation for going to the graziers. Third Farmtune session for the team completed this week. We have been mapping the feed allocation process, identifying opportunities for improvement and developing checklists and standard operating procedures. The new supply number is now up at the Hub entrance. This will mean that FB and Kale farm systems milk can, in future, be kept separate allowing vat milk samples to be collected for more detailed milk composition analysis looking at the effect of supplement type on milk processing characteristics.